While Catholics the world over, were busy celebrating Birthday of MOTHER MARY, the Parish Priest of St Vincent Palotti Church, Marol, was displaying his dislike towards her. The following communication from Sachin Pereira, a Devotee of MOTHER MARY to Archbishop Oswald Cardinal Gracias should explain to you the incident, in details. Yours truly also took up the matter with Archbishop. I don’t think the Parish Priest thinks of MOTHER MARY as Untouchable, but we suppose, his ego and arrogance got better of him. Archbishop has forwarded my E mail to the Parish Priest, though nothing is mentioned, His Eminence, certainly must have advised him to make an effort to calm the situation, which we hope, he will follow. I have your email of September 15, 2018. I have passed on your letter to the Parish Priest. Regarding the matter of Malwani, I have been following it up. But since I have been busy with other matters, you can appropriately follow it up with the Zonal Bishop who has full competence to deal with the matter. Thus the matter will not be unnecessarily delayed. Following is copy of the letter, addressed to you by a parishioner of St. John the Evangelist Church, Marol. The letter is self explanatory and surmises everything in detail. Hence, I wouldn’t want to waste your time, by repeating the same. The only matter, in my opinion, stands out is behavior and the language of the Parish Priest. As a priest, he could have easily come forward to bless the Image and the devotees joining in the procession. But that was not to be. His arrogance took better of him. This has not surprised us at all, because, that is the way most of them behave, baring a few. We, being active in the Church matters, are very much aware of it. This has hurt sentiments of the people present, as well of those who heard about the incident. Besides, to make the matter worse, as we have been informed, to justify his action, he tried to communalize it between, East Indians, Goans and Mangaloreans; during the sermons at the Sunday masses. The writer of the letter, Sachin Pereira, has rightly said that, “We leave it to your reasoning and Action”. However, a simple apology from the erring Parish Priest, will douse this fire; lest the flame of discontent, will remain fuming into their minds. I am sure, the wiser counsel will prevail and your good self, will prevail upon him to tender an apology. The Church has always been teaching about reconciliation. Sincerely yours, in Our LORD JESUS CHRIST. 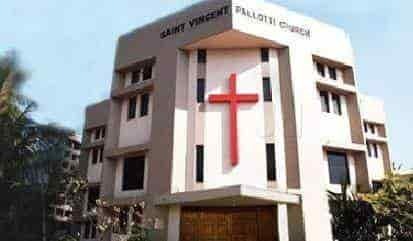 P. S.: By the way, I am still waiting for your response on the matter of St. Anthony’s Parish, Malwani; which you had assured of having a relook. Nevertheless, since we didn’t want it to remain secluded for a long time, it has started appearing on SILENT VOICE. This is with reference to the procession of OUR LADY OF VELLANKANNI that we the parishioners had devotees who couldn’t make it to Vellankanni and would like to show their love and organised at St John the Evangelist Church Marol on the 8th Sept’ 2018 . This was for the devotion by joining in the procession . We the parishioners of Marol St John the Evangelist Church decided to conduct a prayerful procession Of Our Lady Of Vellankanni starting from St Vincent Paulotti church Vijaynagar ending St John The Evangelist church Marol , keeping in mind the birthday of Our Mother Mary and getting both the parish together in faith. We were supposed to start the procession from St Vincent Pallouti church at 4pm, where the PALKI of Our Lady Of Valenkanni was taken. As we entered the church premises ,THE PARISH PRIEST came ahead and told us to leave the premises. Here we had the statue of Our Mother Mary all decorated to be taken in procession with hundreds of devotees waiting for us to start , and in the other hand to our surprise we had to hear this disgraceful statement that too from a priest who showed practically no reverence for our Mother Mary. The words that he used were “PLEASE TAKE IT OUT OF HERE “ . We would like to ask Fr. what does he mean by “IT” .. Does a priest not understand whom he is relating to? Was it not a Catholic idol or was it a Non Faith idol that we had brought to go in procession? A person talking such language especially a man appointed by the catholic faith to lead his flock does not portray a good image to his followers. This did not end here, he also stated that “YOU ARE IN MY AREA ,AND YOU HAVE TO DO AS I SAY “Now where does the question about area come. Our parishioners were so very upset listening to this that one of them told him , IF THIS IS YOUR AREA THEN ST.JOHN THE EVANGELIST CHURCH IS OUR AREA , FURTHER ON PLEASE DO NOT GET ANY BURIAL REQUESTS IN MY AREA. Your Lordship, It deeply saddens me when I am writing this to you, with already the Catholic church in the lime light with various issues this is another one putting it to SHAME, but we damage has already been done, the rage of fire has spread in the entire village and hence would like you to take up this issue on a priority basis and douse the fire before it spreads and more damage is caused. As per me the only way to pacify the devotees is by a written apology from the parish priest which could be read in church. That is what the devotees need. *what wrong did we do by gathering people of faith? *What would be the harm caused if we were just allowed to start the procession from the church premises? It was just a matter of 10-15 min. *What did the parish priest gain by his un-thoughtful statement? The rest we leave to your reasoning and action. A heartbroken and sadden Catholic devotee on behalf of the parishioners. Sachin, the parishioners of Marol as well as thetrue devotees of Mother Mary are with you on this Matter.